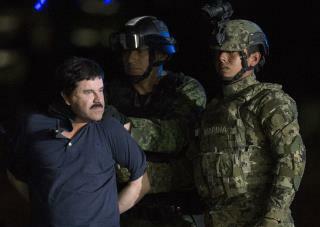 (Newser) – Looks like Mexican drug lord Joaquin "El Chapo" Guzman will be facing trial in the US, CNN reports. A Mexican judge has ruled that Guzman, who was recaptured in January after a stunning 2015 prison breakout, can be extradited to the States. If that happens, officials say he'll go to Brooklyn on federal charges—but his extradition isn't a slam dunk. As the New York Times explains, the Ministry of Foreign Relations in Mexico first has to approve the move over the next 30 days. "The ball is now in the Foreign Ministry’s court and they have a month to execute the process or not," says a spokesman for the Mexican judiciary. "They have been notified and received the file." Of course the Mexican judge wants to give El Chumpo to the US. The Mexican government wants to give us all their POS illegals, drug pushers and lowlifes, because they send most of their money back to their relatives in Mexico. Of course El Chapo has been moved to Ciudad Juarez. Look at the map. A quick jump across to El Paso, and right up the interstate to Pueblo, Colorado. Hook a left, and you're at Florence, Colorado, home of the most secure Federal lockup in the U.S.